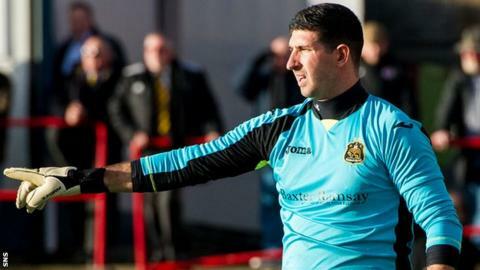 Queen of the South say they beat off competition from clubs in England and Scotland to sign goalkeeper Alan Martin from Championship rivals Dumbarton. Former Scotland Under-21 cap Martin, now 28, has secured a two-year contract after spending a season with Dumbarton. Manager Gary Naysmith told his club website: "Other teams in Scotland, as well as clubs in England, were interested in securing his services. "So I'm delighted the hard work has paid off." Martin began his career with Motherwell before spells with Leeds United, Barrow, Accrington Stanley, Ayr United, Crewe Alexandra, Aldershot Town, Clyde and Hamilton Academical. He becomes Queens' second signing of the week after the arrival of 24-year-old defender Callum Fordyce from Dunfermline Athletic on a one-year deal. "Alan had a very impressive season last year and was arguably one of the most consistent goalkeepers in the Championship," added Naysmith. "While it was relatively straight forward and easy to conclude the deal to bring Callum to the club, we had to work really hard to get this one over the line." Fordyce, who joined the Pars from Livingston in 2015, made only 16 appearances this season, but his last start came in a 1-0 win over Queens at Palmerston Park on the last day of the league campaign.